When an author talks about how much data he has gathered, we are easily fooled into thinking that data are useful. But if the data were gathered such that they suffers from the halo effect (delusion #1) or one of the other delusions, it doesn't mean anything that the data gathered could fill a library. 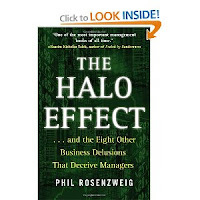 Rosenzweig discusses the popular business book Built to Last as an example. The authors spend ten pages describing their methodical collection of data, how many cartons they filled, and how tirelessly they worked to code it. This serves to intimidate the reader, for how is one to question the results of authors who have done so much research? But the major problem is that this data suffered from the halo effect. The quantity of data is beside the point if the data aren't of good quality. As Rosenzweig states "You can stack Halos all the way to heaven, but you've still only got Halos."